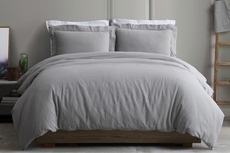 A row of hemstitching adds the right touch to this classic duvet cover set. Two favorite fabrics come together to create an elegant ultimate texture. Stonewashed fabric creates an ultra softness. Smooth cotton and natural linen get softer and softer with every wash, taking relaxed refinement to a whole new level. Classic Button Closure, Concealed Interior Corner ties to secure a duvet insert from Bunching or moving.